Since the devastating freeze that gripped Florida in January 2010, I haven't paid a lot of attention to snook on the state's Gulf Coast. Admittedly, I'd kinda forgotten how much fun these fish can be, but a recent visit to a true inshore gem on the peninsula's opposite side renewed my zeal for the pin-striped rod-benders. Florida's premier inshore gamefish is far from absent on the west side, but numbers are still down, harvest remains – rightfully – closed and rounding up a day's worth of decent action is still speculative in many formerly productive areas. Not so in Jensen Beach. During a morning of wade fishing with Capt. Greg Snyder, we tapped into a major snook feed that yielded loads of action, topped only by my personal best snook that would come a day later. First things first: Snyder picked me up just before dawn at River Palm Cottages – a cozy little fishing lodge/vacation spot with a tropical vibe right on the Indian River. After some daybreak snook action at the St. Lucie Inlet jetties, we ran inside to the Crossroads – a broad expanse of shallow grass flats so named for their intersection of the Indian and St. Lucie rivers. An outgoing tide presented the perfect scenario and Snyder knew just what to do. I could bore you with poetic ramblings, but sometimes, direct descriptions work best. On this morning, snook – big ones – were feeding voraciously as the falling water pulled mullet and other forage off the flat and out toward the deeper edges. The leaving tide was rapidly draining the area, but the snook stubbornly continued their, now, very shallow feeding. How shallow? We watched several hefty linesiders scooting across the flat, bellies on the sand and backs out of the water. I've seen redfish do this and bonefish, as well. 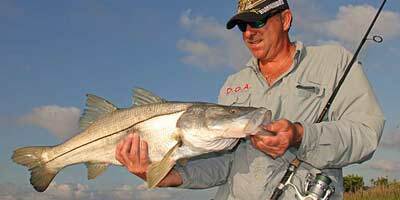 But this was a first – stalking and sight casting to individual snook. And a random occurrence, this was not. We spooked many more fish than we saw in time for measured casts. To say we were nearly tripping over big snook was no exaggeration. "Wading is the best way to approach fish in this scenario," Snyder said. "You can't get close enough to them in a boat because the flat gets too shallow on an outgoing tide. But if you get out and walk to the fish, you can catch (several)." A variety of soft plastic jerkbaits and light jigs will produce on falling tides, but Snyder chose a ¼-ounce D.O.A. shrimp. The bait's removable insert weight gives options for water depth and castability, but the key benefit – aside from its striking crustacean mimicry – is the bait's upward facing hook. Protruding through the back, this point rarely fouls in the low grass and it typically hooks fish near the top of the mouth for solid connections and easy removal. Had my Indian River visit concluded with only these snook memories, I'd have returned to the Gulf Coast squarely satisfied. However, when D.O.A. founder Mark Nichols took me wading on another Indian River flat even closer to River Palm, this one just south of the Stuart Causeway, my decision to indulge the latter half of my journalist-angler duality proved a wise investment of one morning. On this day, I had armed myself with a 7-foot Quantum Exo series spinning rod and an Exo30PTi reel – a super-light outfit made principally for bass pursuits. Minding the harshness of Florida summers, I wanted to see how helpful such airy armament would be at minimizing fatigue. I had envisioned locking horns with one of the Indian River's hefty trout; maybe a decent linesider. Needless to say, when 38 inches of pinstriped fury gobbled my D.O.A. shrimp and snatched about 30 yards of braided line off my reel in, oh, maybe two seconds, I knew that I'd soon be looking at one of three outcomes: a blown-up reel, a broken rod or a ringing endorsement for my Exo outfit with a massive ego boost for good measure. Can't say that I assumed the latter, but when I got my left hand around the massive lower jaw of a plump Indian River beauty, that moment capped a memorable visit to an unforgettable angling destination and rekindled a flame that had sadly dimmed. I needed a snook reminder and I got one I'm not likely to forget anytime soon.